Several people have been injured after a car crashed into security barriers outside the Houses of Parliament, Scotland Yard say. Armed police, ambulances and firefighters are responding to the incident in central London, which happened shortly after 07:30 BST. Officers were seen surrounding the vehicle before a man was arrested. Reports say cyclists were hit but police do not believe anybody is in a life-threatening condition. London Ambulance Service said two people were treated at the scene and have been taken to hospital. 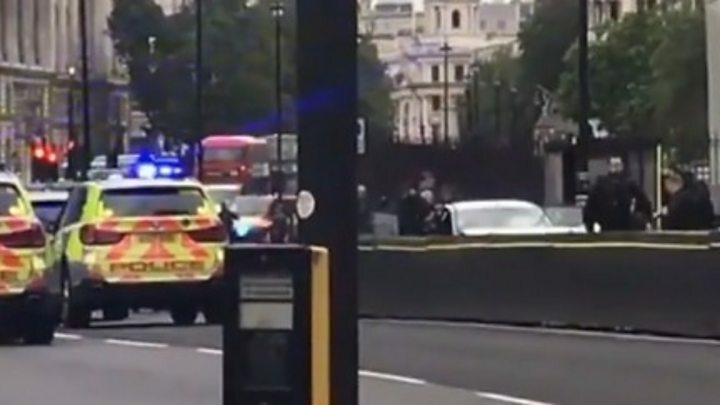 Scotland Yard cannot say if the incident is related to terrorism at this stage but a number of eyewitnesses have said the car appeared to deliberately hit members of the public. Westminster tube station is closed and streets around Millbank, Parliament Square and Victoria Tower Gardens have been cordoned off. People have been moved further back from the area as police put up a Terrorism Act cordon, officers at the scene said. Parliament is currently not sitting. An eyewitness said the car was travelling westbound past the Houses of Parliament when it swerved into eastbound traffic. Images posted to social media showed a man in handcuffs being led away from the car by officers after the crash. “Then it swerved back across the road and accelerated as fast as possible and hit the barrier at full pelt. Jason Williams told the BBC Radio 4 Today programme the driver had “driven at speed – more than 40 mph”. He added: “There was smoke coming out of the car. I have seen people on the ground, lying on the road. I don’t know if they have actually been hit by the vehicle or not. The BBC’s Callum May, at the scene, said: “Parliament Square is now ringed by blue police tape. There is a large group of armed officers in the square. “Paramedics are treating a small group of people sitting on the ground outside the Palace of Westminster. More than 10 police vehicles and at least three ambulances were at the scene outside Parliament. Firearms officers and at least two police dogs are stationed inside Parliament Square. Victor Ogbomo said: “I just stopped the bus. The police said we have to move back, then in less than five minutes the response team came. Scotland Yard said: “At 07:37hrs today, a car was in collision with barriers outside the Houses of Parliament. London Ambulance Service said that as well as three ambulance crews, responders in cars were also sent to the scene. “We have treated two people at the scene for injuries that are not believed to be serious and have taken them to hospital,” a spokesman said. Rush hour traffic is being diverted and workers have been told there may be a long wait before roads are reopened.